MADISON, Ill. – Rinus VeeKay extended his Pro Mazda Championship Presented by Cooper Tires lead to 47 points after a dominating performance at the Mazda St. Louis Pro Mazda Oval Challenge at Gateway Motorsports Park. The 17-year-old Dutch driver lead both practice sessions, qualified second, and took the lead at the start of the 55-lap race and would go on to win his fifth race in a row and seventh victory of the season. The rookie Pro Mazda driver would pass polesitter Harrison Scott on the outside of Turn 1, gapping the field comfortably down the back straightaway. VeeKay’s Juncos Racing teammate, Robert Megennis, would pass Scott as well into Turn 3, setting up a Juncos Racing one-two finish at the checkered flag. At the finish line, the KNAF Talent First driver would have an eight second gap over his teammate Megennis to win his seventh race of the season. VeeKay is now one step closer to winning the Mazda scholarship, a prize worth almost $800,000 USD to graduate to Indy Lights, the top series on the Mazda Road to Indy for the 2019 season. 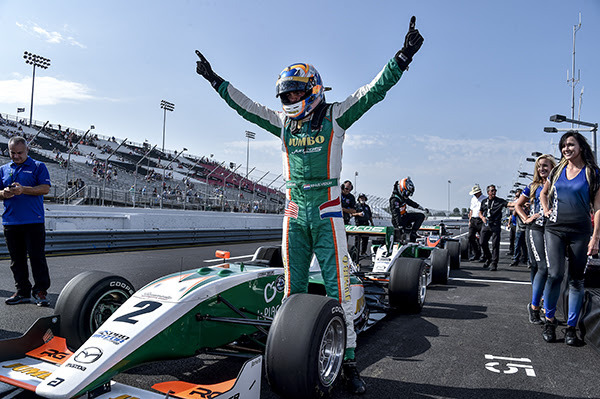 Rinus VeeKay and Juncos Racing will look to close out their impressive 2018 season with the Pro Mazda Championship titlenext weekend at Portland International Raceway. The series will visit the track for the first time since 2008. All races will be streamed live on Road To Indy TV.